Also, called the orca, the killer whale is the largest of the dolphins and said to be one of the world's most powerful predators of the sea. They are immediately recognizable by their black tops and white bellies, and they have white patches near the eyes. They are very intelligent and trainable stars in many aquarium shows. Males can reach up to 32 feet in length and weigh up to 22,000 lb and females can reach 32 feet in length and weigh up to 16,500 lb. Killer whales can live as long as 90 years. Like all cetaceans, this species depends heavily on underwater sound for feeding and communication, using clicks, whistles, and pulsed calls. They are very social, and many orcas live with their mothers for their entire lives. Killer whales are the most widely distributed of the cetacean species in the world, and probably the most widely distributed mammal species as well. They can be found from the polar regions to the equator, but they mainly prefer cold, coastal waters. They hunt in family groups of up to 40 individuals, called pods, feasting on marine mammals such as seals, sea lions and whales. They are sometimes called "wolves of the sea" since they hunt in groups like wolf packs and are known to take down large whales. They are also known to grab seals right off the ice. When not hunting or traveling, they like to engage in acrobatic behaviors for play such as breaching, spyhopping, and tail-slapping. They are very protective of their young and other young females sometimes assist the mother in caring for them. Females give birth to one calf after a 17-month pregnancy. The official population for the killer whale is currently unknown, but it is believed that less than 50,000 individuals remain. The population has declined mainly due to water pollution and lack of food supply due to over fishing by humans and whaling. 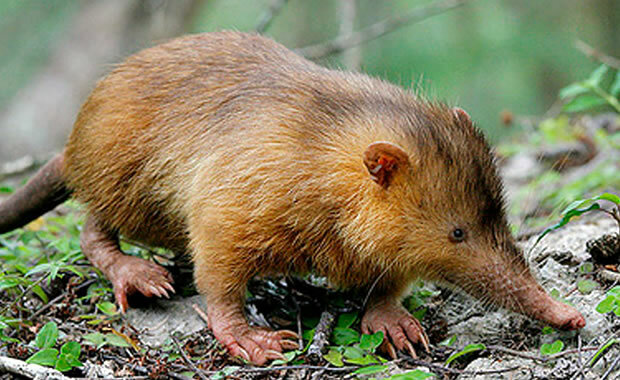 Due to lack of data, it is listed as "Data Deficient" with the IUCN, but the species is legally protected in the United States with an "endangered" status. Copyright Notice: This article is licensed under the GNU Free Documentation License. It uses material from the Wikipedia article "Killer whale". Glenn, C. R. 2006. 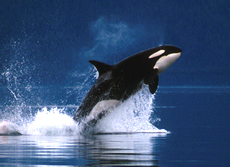 "Earth's Endangered Creatures - Killer Whale Facts" (Online). Accessed 4/24/2019 at http://earthsendangered.com/profile.asp?sp=1647&ID=9. Need more Killer Whale facts?